Finance Minister Arun Jaitley announced during the budget that the next financial year (2018 April-March 2011) will be 7.2 to 7.5 per cent. On Thursday, Jaitley introduced a budget in the Lok Sabha. This is the final full-scale budget of the Modi sarkar before the forthcoming general elections. This was the fifth time when Arun Jaitley introduced the budget in the Lok Sabha. In contrast to the past, he made a budget speech in Hindi. He said that the GST was good for the poor and the people. The statement made clear how much the government would like to see the country's growth from the effects of demonitization and GST. According to the Economic Survey, the country's GDP is likely to be around 6.75 per cent in the current fiscal. 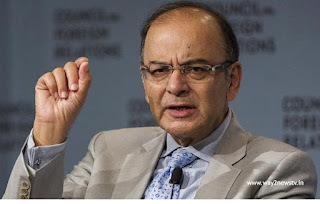 Jaitley said India, which is currently India's seventh biggest economy, will be in the fifth position soon. He said that we are going to remove poverty in the country. Jaitley said that economic reforms were speeding up. We have a policy of discrimination in the country by the time we came to power four years ago. In these four years, Modi has initiated systematic reforms. Jaitley said India has emerged as the fastest growing economy in the world.